The internet can be such a great resource in the kitchen! Just as you are reading this blog for an idea for supper, I too, surf the web, in search of inspiration for recipes. Just the other day I was perusing Pinterest and came across a blog called Eat.Style.Play (The site can be found HERE.) 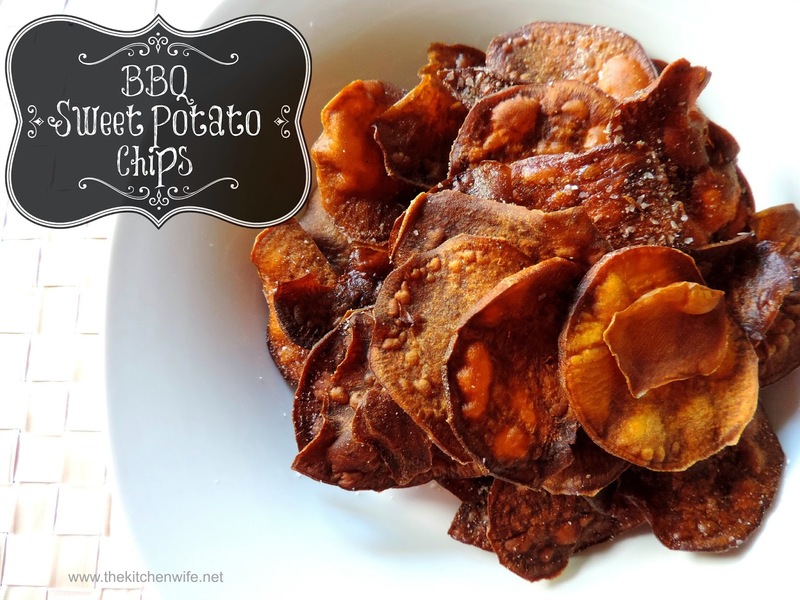 On her blog, this blogger had the most delicious looking sweet potato chips, and I thought "I have to make those tonight!" However, I wanted to add my own twist to them, so I came up with a sweet and smokey BBQ seasoning for them! The chips were out of this world, and I can't wait to show you how I made them! Now, you will need to peel the sweet potatoes. Then you will slice them. See how it cuts each slice evenly, ensuring consistent cooking. In your skillet, add about an inch and a half of oil. Allow the oil to get hot. wooden spoon in and the oil bubbles around it. add them to the oil. You will need to do this in batches so as not to over crowd the skillet. Allow the slices to cook for 6 minutes or until golden brown. they do not stick together. and place them on a baking sheet lined with paper towels. Season them liberally with the BBQ seasoning. Sweet, smokey, and crisp sweet potato chips! These are perfect with any sandwich or burger! Hey, these would be perfect for a simple afternoon snack! What a great alternative to the traditional potato chip! Oh, and what a fantastic way to introduce a new vegetable to your children! Give these a try this summer season! In a small bowl, mix the salt, sugar, onion powder, smoked paprika, and pepper together. Next, peel the sweet potatoes. Then, using the mandolin slicer, slice the potatoes. Place a heavy bottom skillet over a medium/high heat. Allow the oil to get hot. You will know it is ready when you can place the handle of a wooden spoon in and the oil bubbles around it. In small batches, using the slotted spoon or spider, add the sweet potatoes slices to the hot oil. Let the sweet potato sliced cook for 6 minutes, or until golden brown. Use the slotted spoon or spider to push the chips around while fry so that they do not stick together. Remove from oil and place on a baking sheet lined with paper towels. IMMEDIATELY season liberally with the BBQ seasoning.